Need a Smile Makeover? Visit Your Orthodontist in McMurray! When you were growing up, picture day at school was never one of your favorites. That’s because you’ve always been self-conscious of your bite problems (malocclusion). Now that you’re an adult, you’ve discovered that the issues go beyond just aesthetics. Your malocclusion could lead to jaw problems, affects the way you speak and the digestion of your food. You need a tried and true method to make corrections, which is why your orthodontist in McMurray says that braces are the best route to take. Continue reading to learn more about the process. Braces are effective in correcting your smile because they apply constant pressure to your teeth, encouraging them to properly align over time. In addition, they are very durable, which ensures that they can stand up to the rigors of all the food and beverages that will bombard them throughout the treatment process. 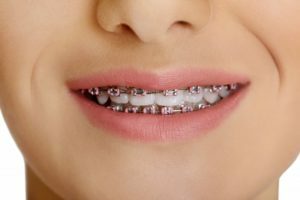 Traditional Braces – These are the traditional metal kind that you probably picture when you think of braces in McMurray. They consist of metal brackets that are placed on the teeth and are surrounded by elastic bands that hold a metal archwire in place. The latter is used to apply pressure to your teeth and will be adjusted every four to eight weeks. Ceramic Braces – This option offers the benefits of the constant pressure of braces with a more appealing look. The difference is that the brackets are made from tooth-colored ceramic, which the archwire snaps into. The latter will apply a controlled amount of pressure to your teeth throughout the process to encourage them to adjust to their final corrected position. What are the Benefits of Correcting Your Bite? Each tooth plays an integral role in your ability to chew and digest your food. When they don’t meet properly at the mesh point, there will be a loss in function. Therefore, you won’t be able to fully digest your food. Furthermore, you’ll experience problems pronouncing certain words, as the position of your teeth plays an important role in forming particular sounds. When your bite is corrected, these challenges won’t be a factor. Another problem that could arise from malocclusion is a condition called temporomandibular joint (TMJ) disorder. This is the joint that is mainly responsible for opening and closing your jaw. When there is malocclusion, it alters the alignment, creating uneven distribution of force in the joint, which can cause pain and inflammation. Correcting your bite is a great way to prevent this condition. In addition to the corrective benefits, when your teeth are straight, you’re going to feel like a new person. Instead of running from the camera, you’ll be running to it! So to get the process of fixing your bite started, reach out to your local dentist today! Practicing orthodontics for over 20 years, Dr. Gary Cartwright earned his Doctor of Dental Medicine degree from the University of Pittsburgh. He then went on to receive his Orthodontics degree from the University of New York, Stoney Brook. A board-certified orthodontist, Dr. Cartwright practices at Cartwright Orthodontics and can be reached for more information through his website. Comments Off on Need a Smile Makeover? Visit Your Orthodontist in McMurray!